Recently we did an article about “Why we need US Immigration Reform in 11 Charts” which eloquently talked about what we had identified as the 13 broken areas of US Immigration that needed to be fixed for true US Immigration reform and which was to a decent degree addressed at least in the initial version of the US Immigration Bill submitted to the US Senate in April 2013. Since then luminaries such as Bill Gates, Vivek Wadhwa, Mark Zuckerberg via his Fwd.us SuperPAC and led by the Obama White House have pressed the need for Immigration reform for the US Economy at large. 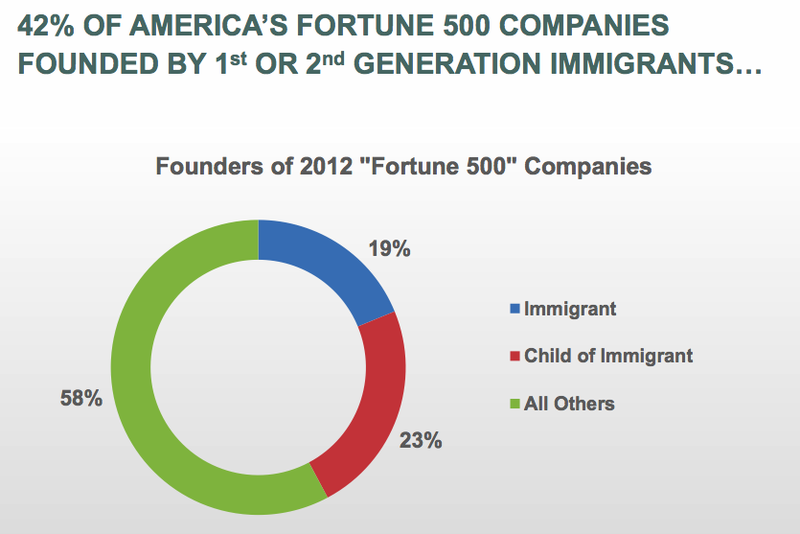 The latest entrant to this list, albeit a constant advocate for US Immigration reform is Mary Meeker. Mary Meeker came to fame in her Morgan Stanley days in the 90s backing many of the Internet heavyweights we take for granted today. Later on in her time there and now in her current role as a partner and head of a large fund at Silicon Valley Venture Capital giant, Kleiner Perkins Caulfield Byers (KPCB) she is covered extensively in the media because of her annual State of the Internet reports which she releases with colleague, Liang Wu and can be dowloaded here. In her latest State of the Internet 2013 report she actually devoted a portion of it to the need for Immigration reform and how it is hurting US technology and economic prospects today and into the future. Then separately for the first time she devoted a separate presentation to “Immigration in America & The Growing Shortage of High-Skilled Workers“. It is actually something we also talked about way back in 2009 with US Immigration & Education Policy and according to Meeker and Wu’s latest research the problem is only accelerating. Now the world has changed a lot in the last 25 years since this was made and become increasing more global and there is probably a couple of other countries in addition to the US that you could include in this list, namely Canada, New Zealand and Australia where any immigrant can become a local. However the statement is very true when it comes to the essence of the US and she uses that as a sad state of affairs today with US Immigration policy being more akin to the other countries of the world who are more hostile to immigrants ever being anything more than visitors our outsiders no matter how they may live in a given country. 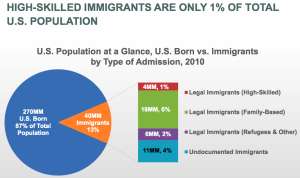 The chart below shows US Immigration as a snapshot in 2010 to highlight the false rhetoric and the total missing of the point not to mention factual errors in most US Immigration debates. As can be seen only 1% of total US population is High Skilled Immigrants and that is only 10% of the total 40M Immigrants currently in the US. Therefore all the debate about skilled immigrants taking US jobs and too many visas is completely false and in two of our most recent posts covering Green Card Salaries and Foreign Immigrant Salaries we also show that for the most part these immigrants are commanding salaries commensurate with being highly educated and thus paying a lot of taxes. The other two visuals we wanted to highlight from their excellent analysis come from who actually has founded the great American companies and just how much wealth and jobs that has meant directly (not including indirect jobs) for the US Economy. 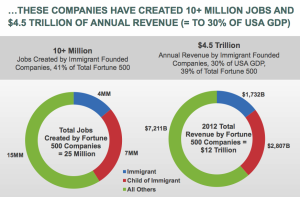 In short 4.5 Trillion dollars or 30% of total US GDP is the result of immigrants and to put that in perspective that is about the equivalent of the entire GDP of Latin America, Japan or India today. 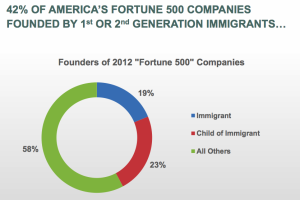 In fact according to the 2011 “New American” study in 2011 cited in the report, 7 of the 10 most recognized and valuable global brands were founded by 1st or 2nd generation immigrants to the US. This includes; GE, AT&T, IBM, Google, Marlboro, Apple and McDonalds. Ultimately I hope this report educates you personally and your discussions with your social circles and ultimates helps influence the way you assess all levels of elected officials when they are truly talking about the future innovation and prosperity of America. Do I Need A Lawyer For My E3 Visa Process?